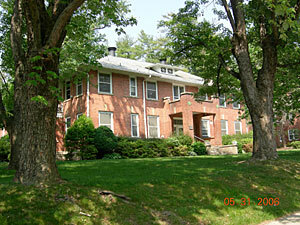 Classical Revival/Bungalow style two-story building with a hip roof, wide overhanging eaves, and curved rafter ends. Hip roof dormer at front. Rear wing added later. Front entry portico is more Craftsman in its design, with square brick posts, a flat roof, and parapet wall with decorative tiles. Walls are brick veneer. Windows are one-over-one with radiating vouissoirs and keystones. Notable cut stone foundation with beaded mortar joints on the main block, with brick foundation on the rear addition. The front door has sidelights and a transom. Side entries to the building have these same flat-roof stoops with brick posts. Slanted retaining wall of stone into the hillside around the property. A Partial History of Henderson County (pp. 311-312) notes that the building was dedicated on July 4, 1913. The original portion had thirteen rooms including an office, reception area, operating, women's and men's wards, nurses' room, and two private rooms. In 1917 an elevator and dumbwaiter were installed. 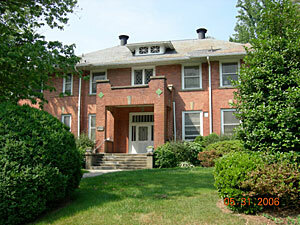 On July 12, 1924, $10,000 was spent to build the large rear wing addition which opened in September 1925. Patton Memorial Hospital pre-dates most of the houses in the Hyman Heights/Mount Royal historic district. It was built on land donated by Mrs. Annie F. Patton from a portion of the Patton land which was associated with Killarney. It began with a staff of four physicians and was in operation for 40 years. Currently in use as apartments. Good condition.